Do you have great food memories, like baking Christmas cookies, or making ice cream in the summer? One of my favorite food memories when I was young was making candy at Christmas time: English Toffee, dipped pretzels, and fudge. Some of my favorite food memories are around the holidays, mixing up batches of cookies and treats to enjoy and give away. If you don’t have great food memories from your childhood, it’s never too late to make some new ones with your own children or grandchildren! While it isn’t the holidays yet, it’s always a good time for fudge! 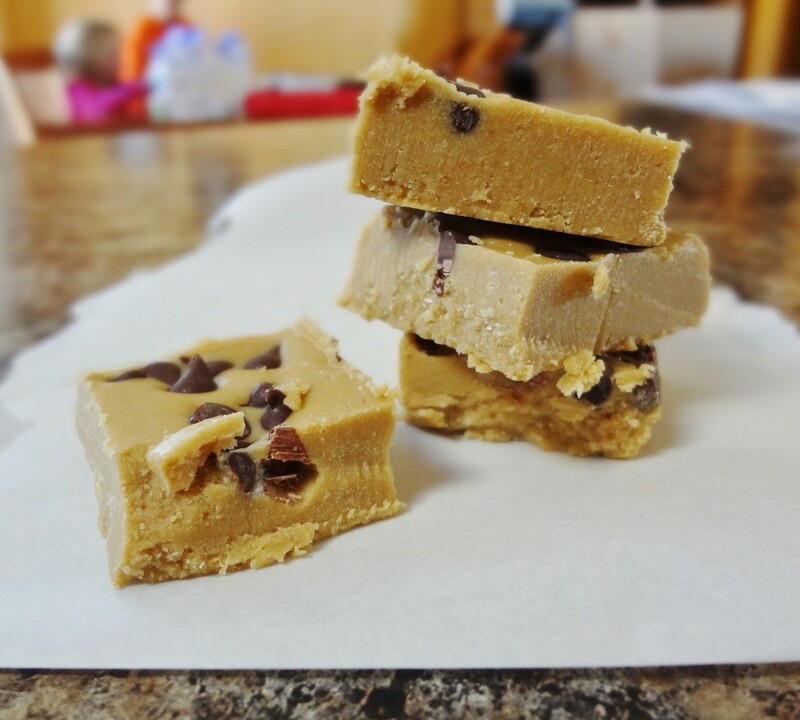 My SunButter Chocolate Chip Fudge recipe is a fantastic small-batch treat when you want something a little sweet but healthier. This one is prefect for people who want a less chocolatey version of my other Chocolate SunButter Fudge recipe. This isn’t the kind of fudge that you can gift people, mostly because it melts so quickly due to the coconut oil. But this is a great treat to keep in your fridge when the mood strikes for a nearly sugar-free treat. 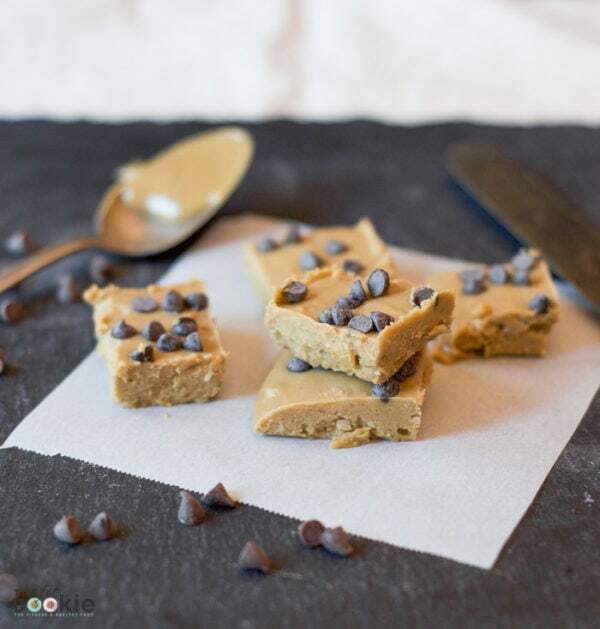 Our SunButter and the Enjoy Life mini chocolate chips has some sugar in it, but if you want a completely sugar free fudge, choose a SunButter variety (or other nut butter) and chocolate that has zero sugar in it to make this recipe completely sugar free. This recipe is paleo depending on the ingredients you choose. This fudge is also quite rich, I would cut this into small pieces for portion control. I find I can’t eat too much of this at once since it is so rich, but I still love keeping some of this in my fridge for a nice treat with a little bit of chocolate on top. In a small bowl, cream the coconut oil with a hand blender until smooth. The coconut oil may melt at this point due to the beater. Beat in the SunButter, vanilla, and Stevia (if using) until creamy. Line a small, square pan with parchment, waxed paper, or plastic wrap. Pour the SunButter/oil mixture into the prepared pan. Refrigerate until the fudge begins to set up. Sprinkle the mini chocolate chips on top and return to the fridge until the fudge has completely set up. This melts quickly, so keep stored in the fridge. You can even store this in the freezer for a firmer fudge. Looks fantastic. I have never used stevia before. How much do you recommend using? Thanks! Hi Andrea! If you use liquid Stevia, add a little at a time to begin with and check to see how you like the flavor. Stevia is a natural plant extract, so it is safe if you get a good quality kind. You can get a liquid Stevia extract (which is much stronger), or a powdered Stevia. If you find you don’t like the flavor of Stevia (some people don’t), you can use a bit of honey or pure maple syrup instead, or a mix of both. Is there a good substitute for Stevia? Hi Katharine! You can use any liquid sweetener that you like in here, such as honey or maple syrup, or a finely granulated coconut sugar. There has been some negative press about the processing involved with agave, so you can use it at your discretion if you like. Assuming that people would use SunButter due to an allergy to peanuts, wouldn’t said person also be allergic to coconut oil? Is there a substitute for the coconut oil in this recipe? Hi Shannon! Peanuts aren’t related to coconut, so there is no cross reaction. A few people may happen to have an allergy to both, but coconut allergies are actually rare. Peanuts are legumes (similar to beans, peas, and soy) and coconut is actually a seed. If you would rather not use coconut oil, you could try using solid palm oil instead for similar results. Thanks for this. Coconuts have only recently been “grouped” with tree nuts, but generally are considered a fruit/seed. Many who are allergic to “tree nuts” (or at least some tree nuts) are not allergic to coconut but it is ALWAYS best to check with your dr./specialist first. I can’t wait to try this for my peanut/treenut/dariy allergic daughter that is fine with coconuts. Absolutely! I think it’s odd that the FDA has started classifying coconut as a tree nut, but I agree: if there is any doubt about coconut, always talk to your doctor. My kids have peanut and tree nut allergies and do fine with coconut too. Let me know how you like the fudge! That fudge looks awesome. Gained 5 lbs just admiring it! Yep, it could! 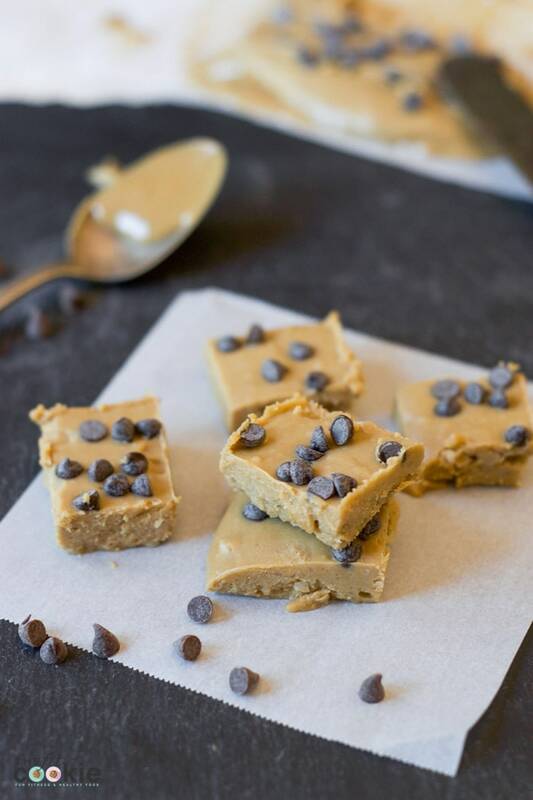 You can have fun with this recipe and try some other nut butters, like pecan butter, hazelnut butter, … you can think of some great variations! Wonderful recipe! I found in Australia we don’t have SunButter but we have an alternative product called Organic Sunflower Butter sold by Organic Road. I will order some and give this a try! Thanks Rebecca! 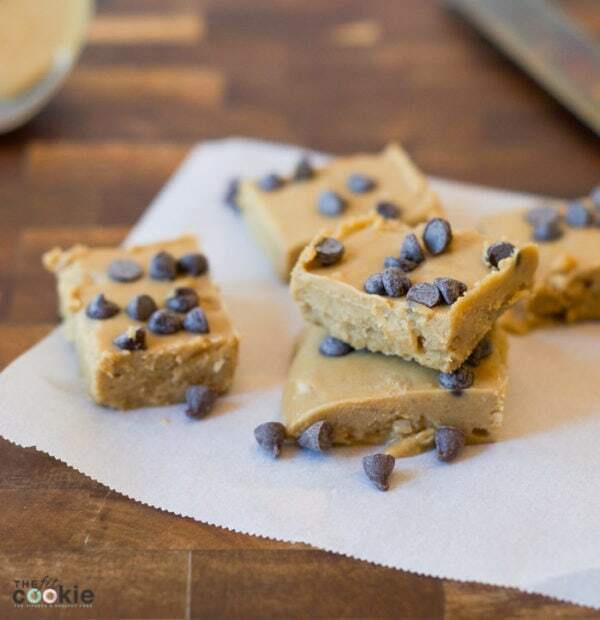 You can also use any nut butter you like in this recipe. Cashew butter might be good, too! In Canada and the US, there are a few different versions of sunflower butter available, including “Sunbutter”. If you are trying to go “nut free” as per school or classroom needs, check your local grocer or health food store and ASK if they don’t have it… They may be able to bring it in, especially if they hear about this request multiple times. Another thing to keep an eye out for is some sunbutters are not made in dedicated nut-free facilities, so make sure to read the label before eating it! Oh I need some of that fudge! And more coconut oil would be wonderful too. Nice giveaway!